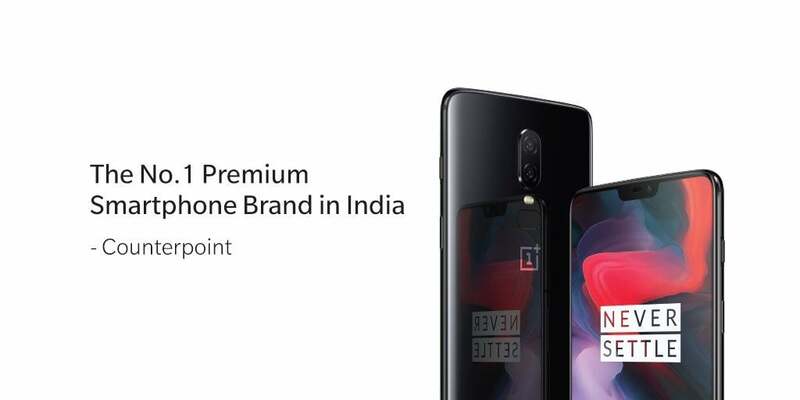 OnePlus, for the first time, led the premium smartphone market segment in India, capturing 40% of the market driven by record shipments of the OnePlus 6. Thanks to its latest flagship handset, OnePlus was the fastest growing brand in the premium segment by 446% in Q2 2018. On the other hand, Samsung secured a 34% share, while Apple captured its all-time low of 14%. As per Counterpoint Research’s latest analysis, the premium smartphone market (> Rs 30,000) grew 19% annually and 10% sequentially during Q2 2018. The uptick in consumer demand in the premium segment was driven by increasing offers around the new launches as compared to a year ago. These offers range from Cashbacks, EMI, Data bundling and Trade-ins, aimed at reducing the affordability gap and therefore the overall premium smartphone segment grew 19% YoY during Q2 2018, said Counterpoint. As mentioned above, OnePlus surpassed Samsung to lead the premium smartphone segment for the first time in a full quarter. OnePlus achieved this on the strong sales of its flagship OnePlus 6 which was launched during the quarter. The previous market leader, Samsung captured over a third of the total premium smartphone market during the quarter. Cupertino giant, Apple had a weak second quarter as demand for its iPhone 8 and iPhone X begin to taper off due to seasonality and challenges in terms of pricing post duty increase. Counterpoint also stated that the premium market grew, but the demand is being skewed towards sub-Rs 40,000 devices due to aggressive offerings such as the OnePlus and that through the online segment. “This is a new trend where “affordable ultra-premium” is wooing aspiring rich and young consumers away from more expensive offerings from likes of Samsung and Apple. With likes of Oppo, Huawei, Vivo and Google looking to be aggressive in Rs 40,000-60,000 segment in coming quarters, pressure on likes of Apple and Samsung will be even higher,” said Counterpoint in a blog post. The top three brands Samsung, OnePlus and Apple contributed to 88% of the overall premium market as compared to 95% a quarter ago. Having said that, this is due to the entry of new players in the segment led by the likes of Huawei P20 Pro, Vivo X21, Nokia 8 Sirocco and LG V30+. Talking about the best-selling models during the quarter, the OnePlus 6 stood first on the list, followed by the Samsung Galaxy S9+ and the OnePlus 5T.